As we slowed for an off-ramp, on our way through Mexico City, we were waved over by police. We have had this experience numerous times and after a few polite questions, we are sent on our way. But not this time. In an attempt to reduce pollution, Mexico City has initiated a system of restricted driving times based on your license plate number. We knew this, and were abiding by the restrictions. The policeman however, asked for our Mexico City Touristo permit for the van, and kept pointing to a set of regulations written in Spanish. We did not have that permit. He replied that for this very serious infraction the fine would be $350 american dollars. Overcoming the initial shock, I asked that he give me the ticket and I would pay at the office tomorrow. But no. He would not let us go until we paid the money to him. We expressed over and over that being Canadian we did not carry American money. (Not entirely true) He was quite disappointed by that. Now anyone who has been through this will immediately recognize it as a shakedown for a bribe, but at the time we thought we might be guilty of the crime. After a long standoff, with the same polite but ridiculous repetitive conversation, we realized he wanted to be paid NOT to give us a ticket. 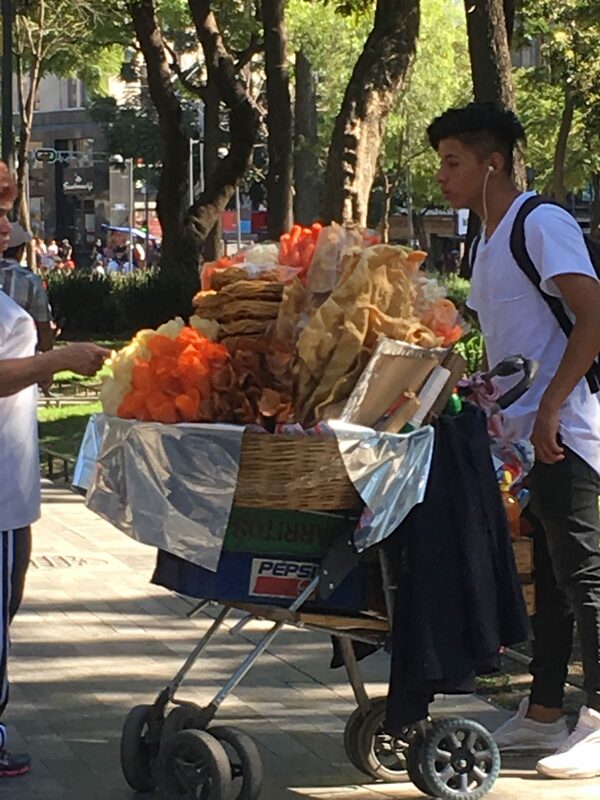 It was getting late in the day and we had to get moving, so we ended up paying about $60 Cdn in pesos. We were bummed by the experience. But we know that police bribery occurs in many countries on our route. We need to stand firm on our right to pay at the office or station, which thwarts any bribery attempt. C’est la vie. Live and learn. 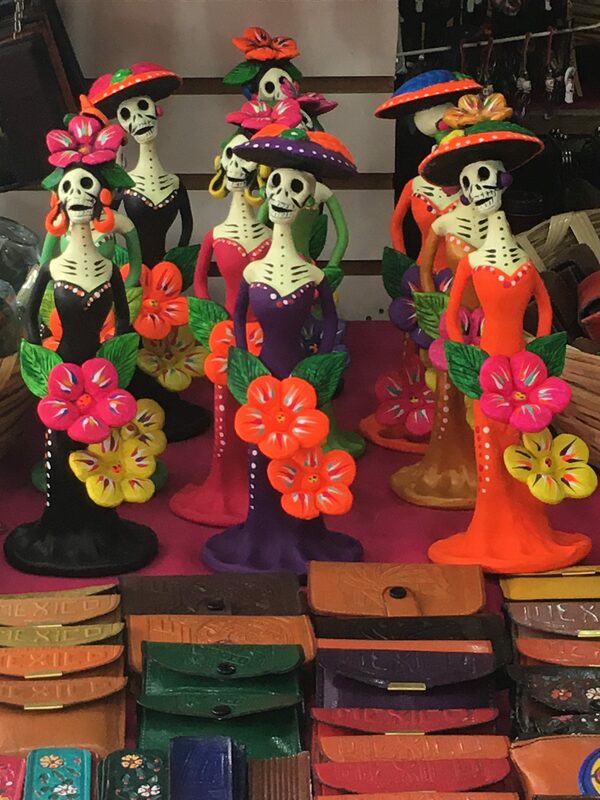 We were relieved to finally arrive at our campground, located 25 miles northeast of Mexico City, in the small town of San Juan Teotihuacan. It was a grassy gated yard, with electrical hookups and hot showers. 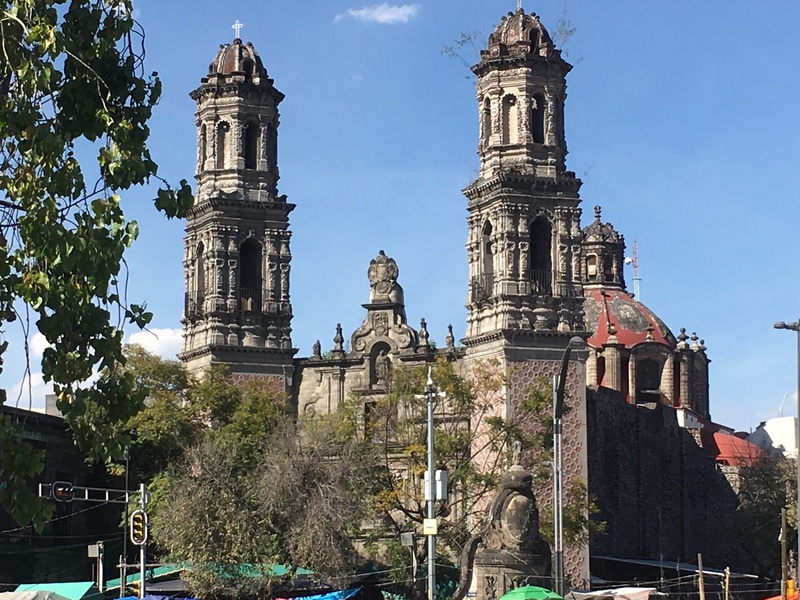 Here we were able to park the van for a few days, walk to the nearby ruins, wander around town, or catch the bus into Mexico City. We met Rudy from Germany who leaves his small RV here year round. He comes to Mexico for the winter and uses the RV to drive and camp around the country. There were about a dozen other European rigs stored in the yard for the same purpose. We spent almost an entire day at the ruins. 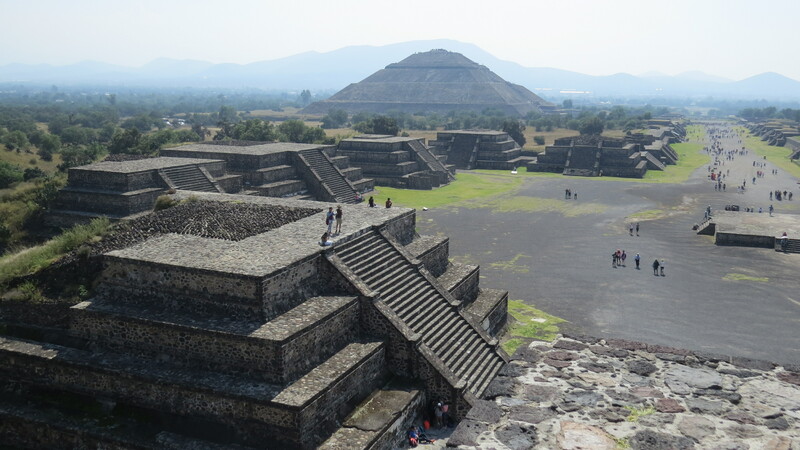 Teotihuacan is an ancient mesoamerican city built in about 100 AD. 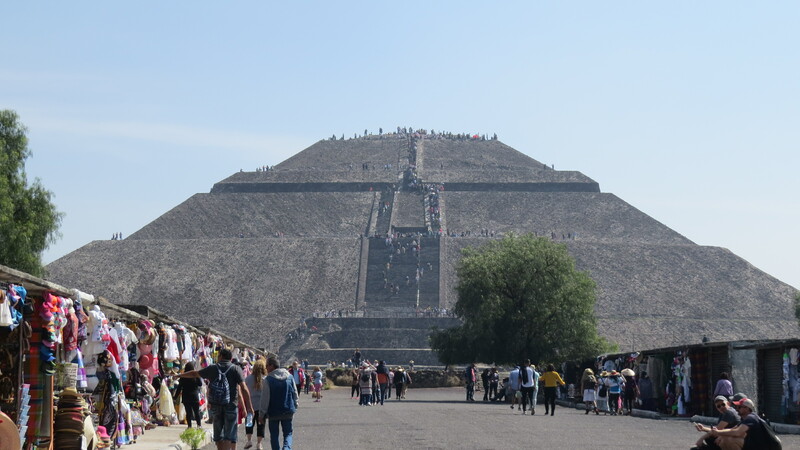 The Pyramid of the Sun and the smaller Pyramid of the Moon lord over the long wide walkway known as the Avenue of the Dead. Along with about 1000 other tourists, we climbed the pyramids and walked the long avenue past various administrative areas and residences of the time. 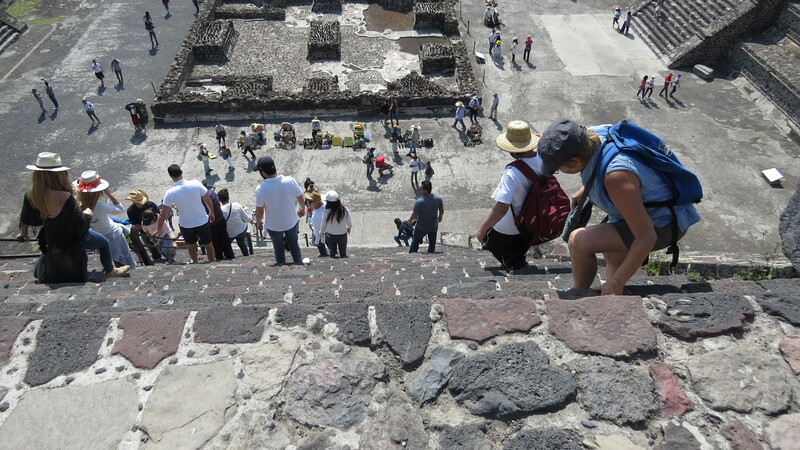 Although there were hordes of other tourists it is a spacious site and very easy to explore. 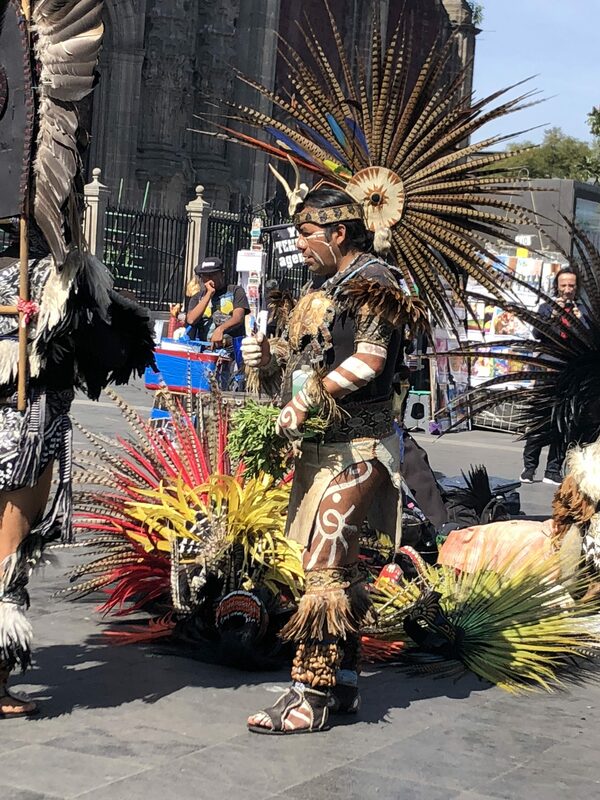 I had never wanted to visit Mexico City, because I knew that there was a high probability I would be kidnapped, tortured, robbed or shot dead in broad daylight. But a year or so ago I met Jose who calls this city his home, and he convinced me that it was worth a visit. So glad he changed my mind. 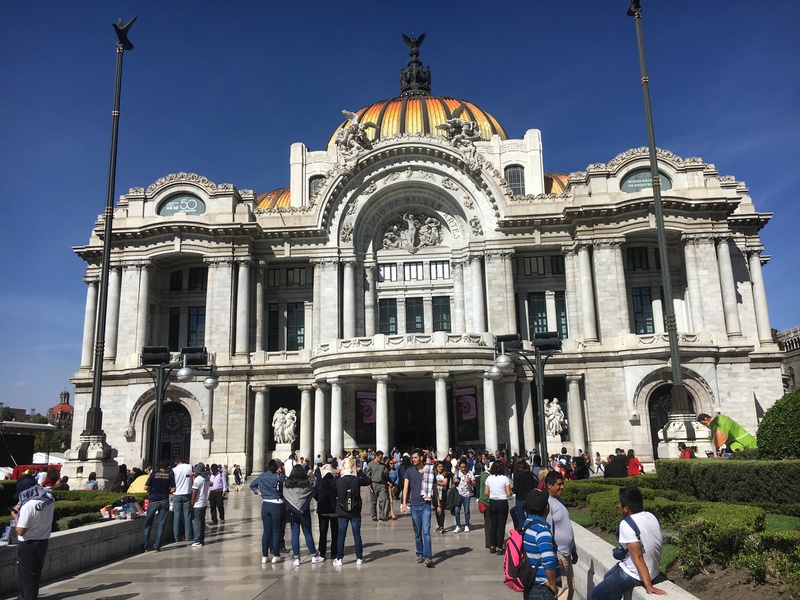 To visit the most populous city in North America, we took an hour long bus ride from our campground to the Autobús del Norte, where we could access the metro. Designed for the illiterate, Mexico City’s metro has 12 color coded lines, and each stop has a name, as well as a unique pictograph symbol. It is as easy to navigate as ordering large fries at McDonalds. Well, these literate Canadians were confused. The large colored map seemed to be a series of squiggly lines, and the names held no meaning. We went the wrong way. Three times we had to get off, find the other platform, and get on again. This lesson in subway riding was cheap though, since the price of a ticket to anywhere is 30 cents Cdn. By the end of our first day it was finally crystal clear. Roaming through the streets, we could visit beautiful old structures such as the Metropolitan Cathedral which was holding an open mass that morning. We stopped in to listen to the choir. The streets were full of entertainers, and every few feet there was a different type of music, competing with the loud calls of hawkers selling food or wares, the sirens of emergency vehicles, and numerous organ grinders cranking out their ancient repetitive tune, sans monkey. It was a vibrant, loud, and happy atmosphere. At the Palacio National, Bob and I were escorted by an English speaking guide named Martin, who proudly informed us that he was THE GUIDE. The interior walls of this building are lined with twelve huge mural paintings by Diego Rivera. 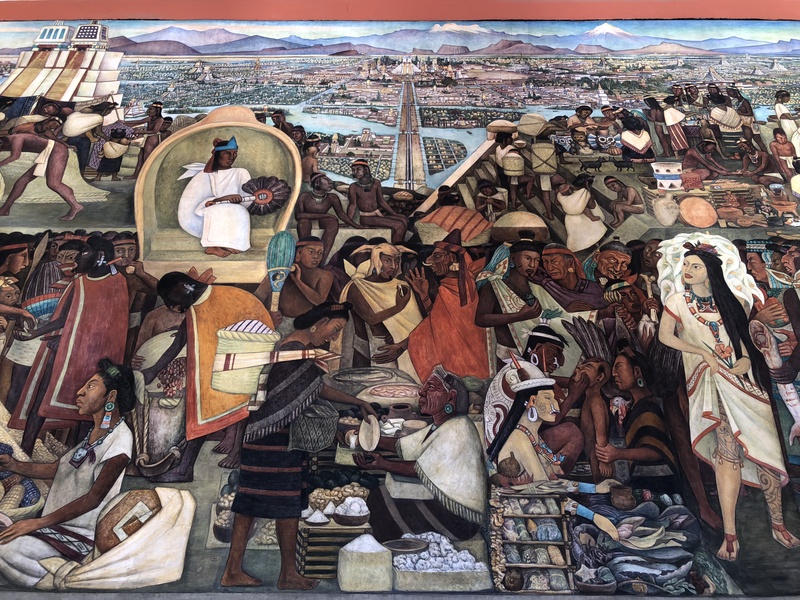 These boldly colored murals depict the history of Mexico, each one having multi layers of detail. Martin gave us a thorough and entertaining explanation of each mural. An elderly man, he also threw in his political views and sprinkled that with a bit of religion. We enjoyed him, and the murals. As far as crime goes we saw one incident of what appeared to be a theft on the subway. A man called loudly for help, others joined him, and the police arrived. The accused and his entire large family were quietly escorted away, in single file, by two policemen. No yelling, no handcuffs, no guns. On the streets there were plenty of police presence, but we observed no anger, no confrontations, no gunshots, nada. Just happy people enjoying a sunny Sunday in their city. 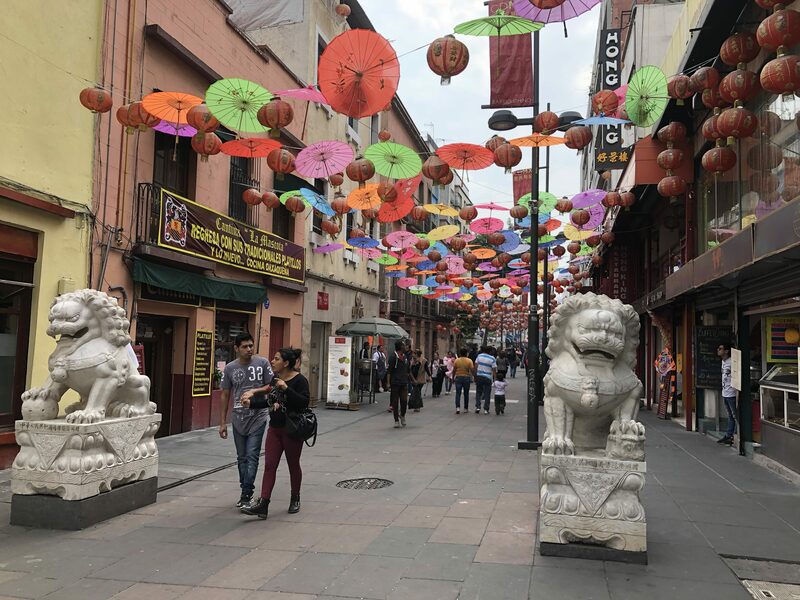 Mexico City has a plethora of museums, art galleries, music venues and theater. It deserves much more time than our 2 days would allow. We will have to return. 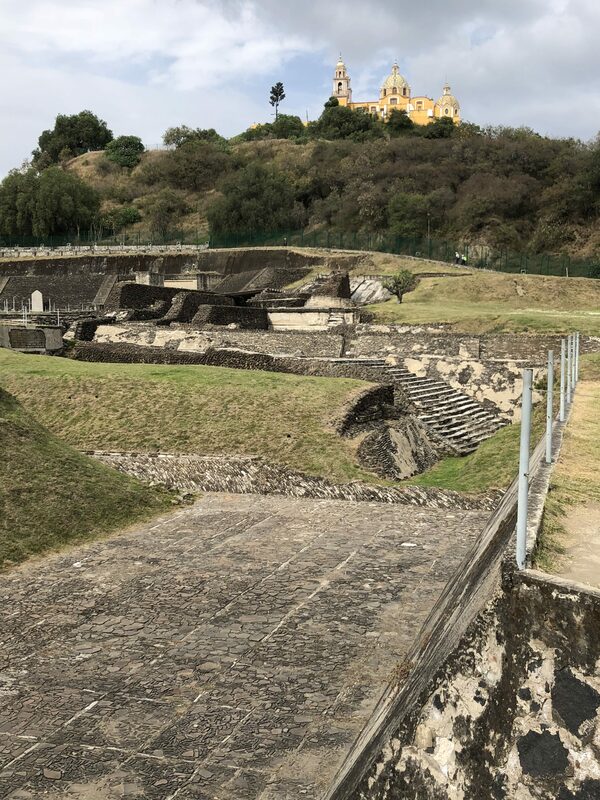 On the road again, we stopped to camp in the quiet town of Cholula, just outside of Puebla. We visited the church, built on a hill that contains the largest pyramid known to exist in the world. The pyramid is not exposed though, so it just looks like a large hill with a church on top. At the base of the hill you can see exposed structures with narrow alleys, rooms, and alters. It was a an interesting walk up the hill and around the grounds. The Plan Head for Oaxaca and San Cristobal, and prepare to cross into Guatemala. 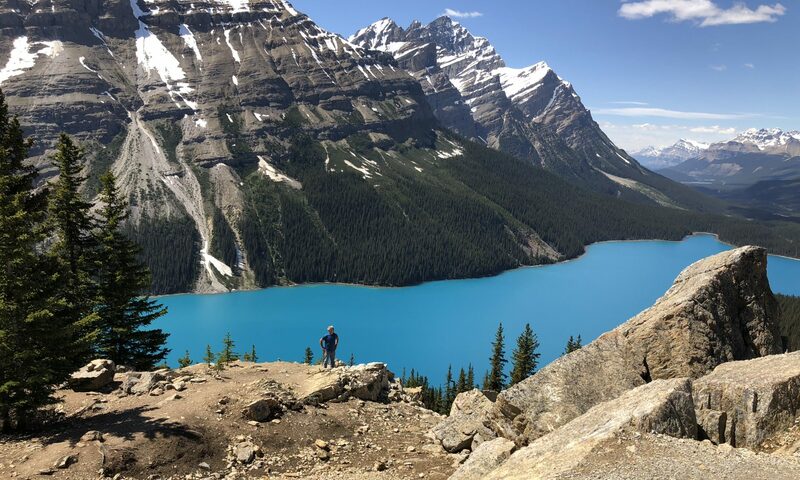 As Canadians the shakedowns leave a bad feeling for being trapped,as visitors to another country, a feeling of gratitude that this is not our normal expectation. Persistence,politeness,and dumbness do pay off…..speaking of our own brushes with shakedowns.Hope you have few or no more of these experiences and many of the super positive ones.Love following along with your posts! We’re really enjoying following your posts! Wishing you continued safe travels & wonderful adventures!